Vault of Light: A wild blog post appears! I'll be honest with you I completely forgot I even had a blog until someone mentioned it the other day. I decided to log in and saw several new comments and discovered I still have several hundred visitors every week despite having not updated since July (Seriously? July, are you for real?) and that made me feel pretty bad! While I really only use my blog for myself it still makes me sad that people would visit and not find anything new. Sorry guise! The Pre-Warlords patch (6.0.2) The Iron Tide came out last week so I've been busy collecting BoA weapons from Heroic Garry for all of my characters. Although I have been having a lot of connection issues since the patch which has left a bit of a bitter taste. I really hope things are fixed for next week. Still, I can't believe WoD is almost finally here and I'm really excited! Back in March I wrote a post containing a list of things I'd like to do in game before or during WoD. Lets take a look back and see what I managed to get done and what I completely forgot to do! Challenge Modes - I completed these on both my Priest and Shaman! Which were the only two sets I really liked. I was mega late to the CM party this time around but plan on doing them much sooner in WoD. Learn how to play and Re-roll Horde fit perfectly into each other. A friend on Twitter joked about me moving to his server and re-rolling Horde to join his raid team. Several months down the line and I've done exactly that! I transferred my Priest (main) to join my already ninety Paladin on his server and used my WoD boost on a Hunter. I transferred my namesake DK (Soco) and an old abandoned Shaman over to join them. 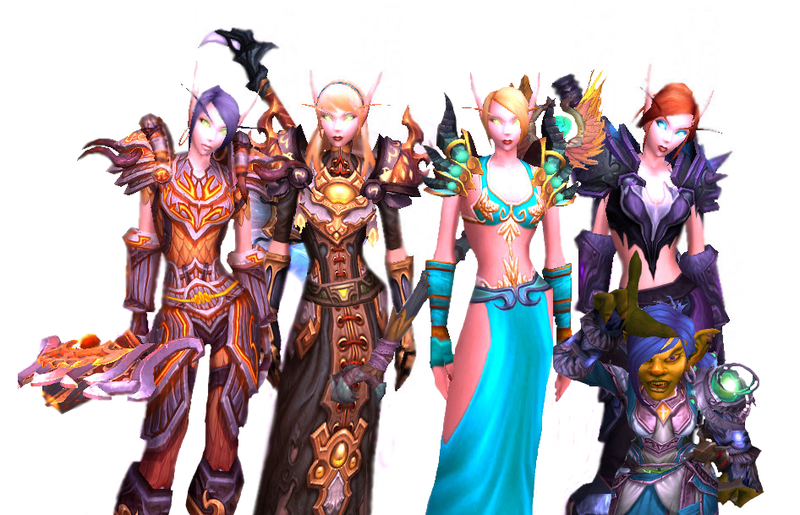 These will be my five characters throughout WoD. I'm going to try my absolute best not to level or play any other characters. My altaholism had gotten beyond a joke in MoP. I finished Vanilla with 2 x 60's. BC with 6 x 70's. Wrath with 9 x 80's. Cataclysm with 12 x 85's and MoP? I've honestly lost count. I think around 17. I recently deleted six level 90's from an old Server. I'll allow myself to level one more alt from 1-100 in WoD but only if I really really have to. In theory I should be much better at my chosen classes. I'm already a much better Ret Paladin than I was a year ago although I'm still Baddy Mc Badderson as melee. Clearly not everyone's happy about the Belf army I've accidentally created. Loremaster - I completely forgot I wanted to finish the last three achievements. I completed the old version and had tasked myself with doing over all of the new zones since the cataclysm. Desolace, Stonetalon and Feralas remain uncompleted.Oops! Achievements - I've gotten a lot more raiding achievements done over the past few weeks. I had stopped raiding during heroic DS so only did LFR throughout MoP meaning I missed out on all of the raiding achievements. I did Heroic Terrace of Endless Spring a few weeks ago with @pixieburst from Twitter as well as Siege of Orgrimmar. I only have to finish off getting the Klaxxi buffs to get my mount! This weekend we plan on going to Throne of Thunder so hopefully I'll get a few from there and be a bit closer to the getting the mount from the meta. Brawlers Guild - I completed Brawlers as well as Deck your collection and the previous achievements! I plan on doing the updated version at 100. Giant Dinosaur Bone - These are now BoE but I'm at 4000. Part of me wants to continue to grind the rest but a bigger part of me wants to just buy them and be done with it because I'm lazy. I'm not sure which side will win out yet. So we had some wins and some losses. All in all I've been having a pretty good time in WoW recently. This week I've been leveling pets for the Celestial Tournament something which I've been putting off for ages. I finally hit 200 mounts. I'm finally back on the Horde where I belong and I've joined a guild and intend on returning to Mythic raiding in WoD with a great group of people and my fiance <3. What's everyone else been upto? Did you complete things you wanted to do before WoD? Labels: Achievement, blood elf master race, Brawlers guild, challenge modes, For the Horde!, lists, WoD Hype!